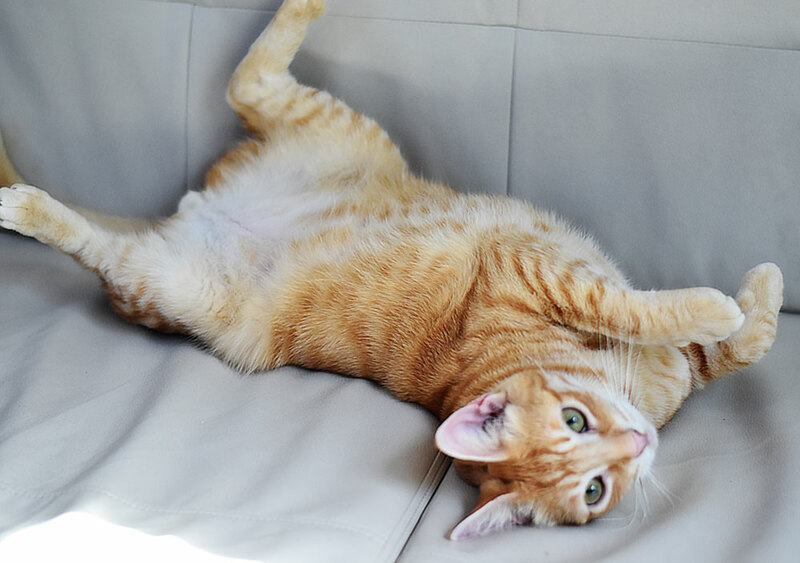 Airstream Trailer Cats: How They Roll! A question we are commonly asked is, how do you manage the cats when driving place to place? And how do they cope with it? The short answer is: we take them in the truck and they are chill with it. But that was not always the case… read on for the secrets to our kitty transport operations. Our first experiment with this was a failure. I had thought that it would be less traumatic for the cats to hang out in the Trailer than to get moved to and from our truck. They would have access to hiding spots, a comfy bed, cat litter and would not be otherwise disturbed. Well, I was totally wrong about that. The Airstream bounces around a fair bit and cats apparently are not keen when their entire world is set into motion. On arriving at our destination, I opened the door to find Kekovar pitifully trying to bury his head in the corner of the couch with the cushions tossed all over creation. The look in his eyes spoke volumes of how much he did not feel comfortable with this event. We both felt horrible! Kia decided to stay hidden under the bed for a good long while and seemed nervous that the world might start shaking at any moment. Want to know how I roll, this is how I do it! Now touch my tummy. I’m totally defenseless, I promise! Bad humans! So, we decided we would make the switch to taking them in the truck for the next trip. The question was how. We had carriers for them, but they seemed pretty small and on a longer trip, we were worried they might need to use the bathroom. We took some measurements of the back seat area and hit up a local pet superstore to see what we could find. Most of the large pet carriers and enclosures just didn’t fit in the back seat. The angle of the front seats meant the space behind them was more a triangle; wide on the bottom and narrow at the top. But persistence paid off and we found a product that works for us. 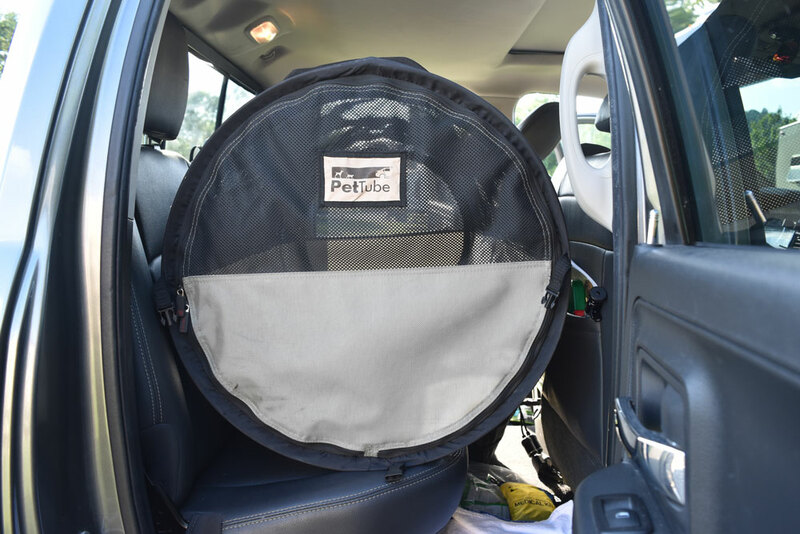 We picked up the Petego Pet Tube Kennel which looked like it might fit in the back seat. And indeed, thanks to the fact that the sides are not rigid, it did. We have to set it up with the seats forward and then move them back into place which squishes the tunnel a bit. This doesn’t do it any harm and it helps keep it securely in place. 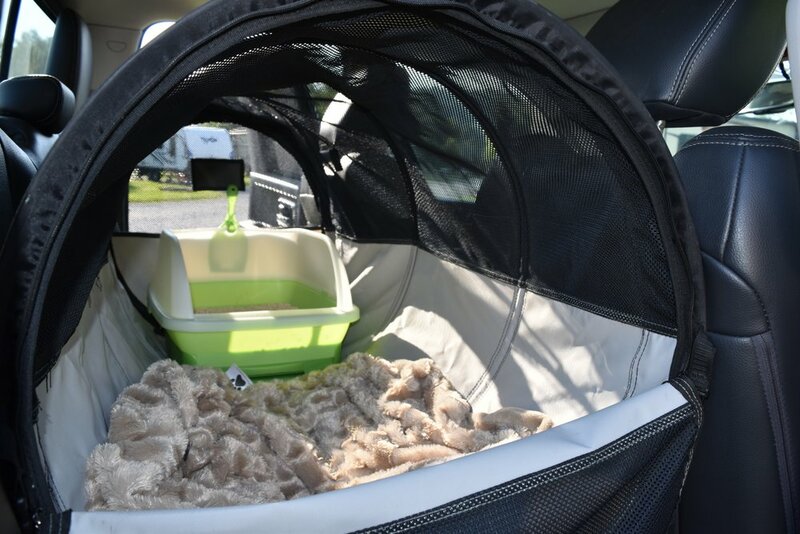 It’s quite large and takes up almost the length of the back seat which leaves room for both cat litter and cats. To make the kitties at home, we stock it with a thick towel and some fuzzy blankets. When we put them in the tunnel we cover them with the blanket which seems to keep them calm for the trip. 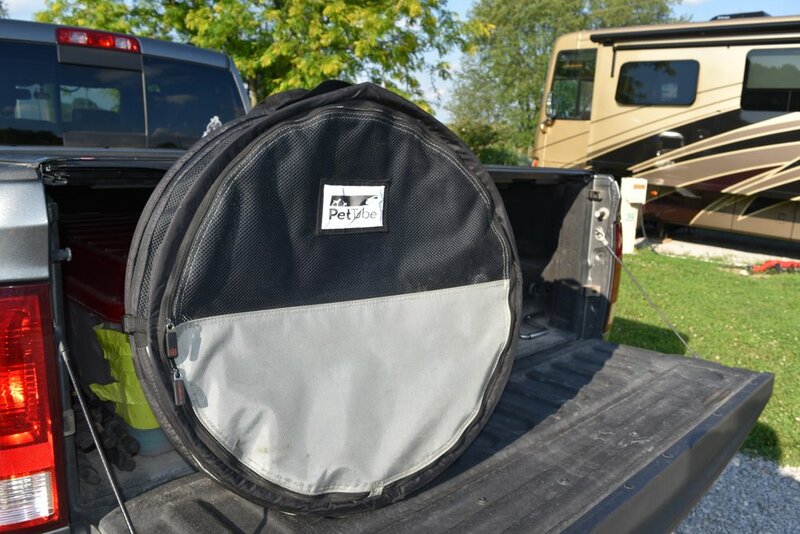 We use our normal cat carriers to move the kitties from the trailer into the tube and back again. This is what they look like. We have the larger one. The tunnel collapses nicely into a flat disk for storage int he bed of the truck. To collapse it you just smoosh it end to end and zip-it up to keep it smooshed. Un-zip it and it just pops back to its full size. We have found it to be very durable, and it the material is very easy to clean with a rag or sponge as needed. So far, nothing has ripped or frayed on it. I have read that if you have a very determined cat they can possibly tear through the material or force the zippers open. Our kitties have never made a concerted effort to escape the tube. I’ll also add that it is not especially useful outside of the car because of its round shape. If you put it on a hard, flat floor, it rocks back and forth, but in the car, it sits put nicely. Our first trip with the Petego worked well. The kitties were a bit upset at this new shelter, but after a bit of meowing they settled in under the blankets to ride out the ordeal and at the end looked more sleepy than frightened. Trail, knowing how cats work very well, rewarded them both with their favorite wet foods. From then on, after every trip, they get special treats only dispensed after car rides. After about three trips they connected these two events and would eagerly hop into their carriers knowing that in a few hours, delicious fish and chicken await them. During the ride, they just nap quietly. Treats are your key to happy traveling cats. And they are best given when your cats are feeling calm, after the event you are trying to condition them to. This is what our Pet Tube looks like once we’ve put everything but the cats in it. In more than a year of taking the cat’s on trips, they have used the litter box once or twice in transit. We still put it in there just in case, but there seems to be some consensus that cats will mostly not use a litter box on the go. Our trips tend to be limited to 3 hours of driving or less, so a longer trip might increase the need for it. We collapse the Pet Tube and store it in the truck bed. Pet Tube Closed and in the Back Seat. We are newbie Airstreamers-have a 23 ft signature International. We have been on several big trips and hope to travel more this year. But i really want to bring 3 of my kitties along (I have 8 but most i have rescued). My questions is-where have you found the best spot to put the litter box in your Airstream? Are your kitties harness/leash walkers? Most of the time we kept the litter box near the front door of the trailer where it was mostly out of the way and easy to get to. Cleaning the box ASAP after use was the key to keeping the place smelling decent. If we needed that space we’d temporarily relocate it under the galley table. We trained them to go on a harness but only one of them really took to it. Kekovar liked to go out on leash, but Kia just didn’t like it and would “plant” herself rather than walk around. We got a sort of Cat Tent that we could take them outside and put them in if we wanted to hang out with them outside.